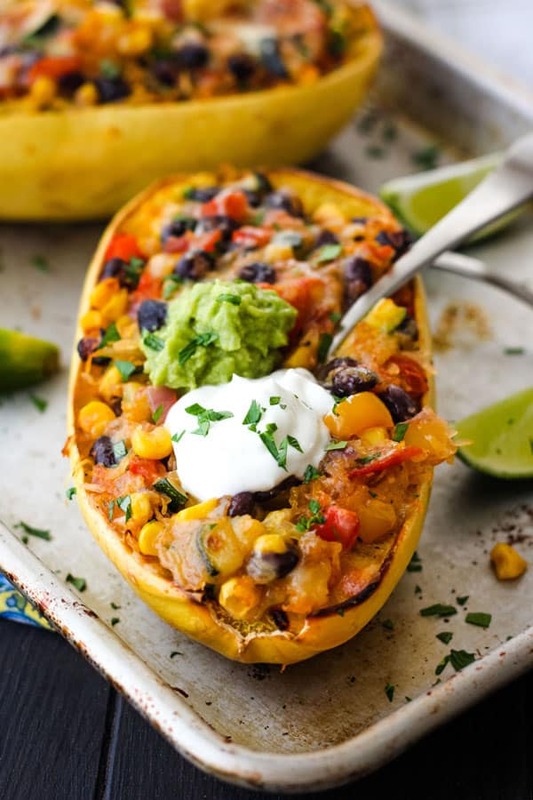 Spaghetti Squash Burrito Bowls are roasted spaghetti squash halves stuffed with a southwestern veggie filling and melty cheese! Serve with your favorite burrito toppings for a hearty vegetarian dinner for two. Spaghetti squash bowls are my absolute favorite way to eat cooked spaghetti squash. Mainly because you can stuff them with ANYTHING! 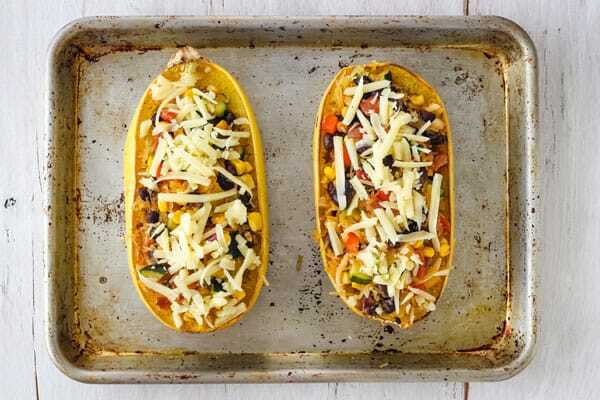 See our Veggie Pizza Spaghetti Squash Boats for proof. Also, they’re perfect for cleaning out the fridge. For these bowls, we sautéed up a small zucchini, a few pieces of bell pepper, and some canned corn leftover from making cornbread zucchini muffins. To add protein and create a sauce, we also tossed in half a can of black beans and a little fire roasted salsa. If you’ve got a fondness for nachos (who doesn’t?) I recommend making a batch of sweet potato nachos or veggie nachos to use up any leftover bell pepper, beans, and salsa. Don’t worry if the recipe seems a little overwhelming at first. It’s easier than it looks. The spaghetti squash only needs a few minutes of prep. 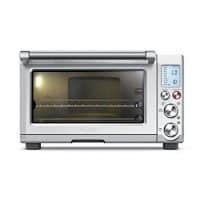 The rest of the cooking time is hands-free roasting in your toaster oven or oven. You can roast the squash or make the filling on separate days. The directions are written so it’s easy to stop wherever you want. And if you’re cooking for one, toss the extra stuffed squash in the fridge for a quick dinner or lunch the next day. 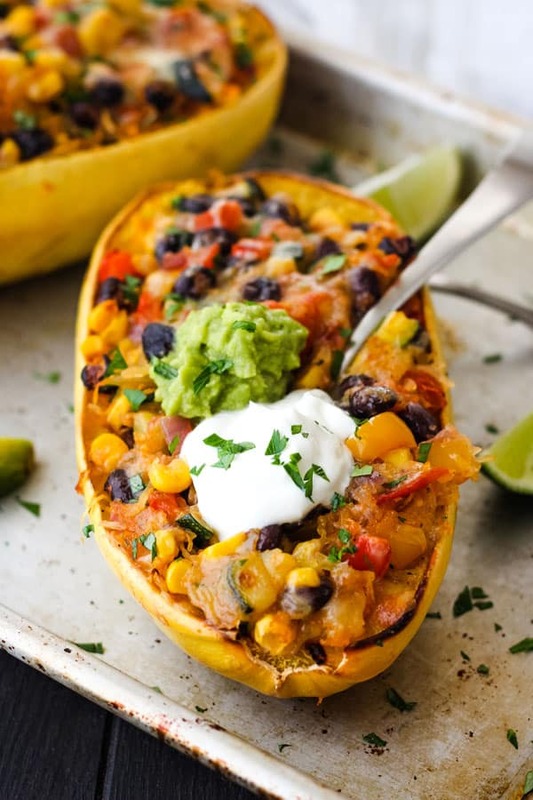 These cheesy spaghetti squash burrito bowls reheat wonderfully! 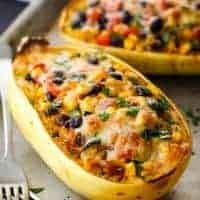 A hearty vegetarian dinner for two of roasted spaghetti squash halves stuffed with a flavorful southwestern veggie and cheese filling. Adjust the cooking rack in your toaster oven (or oven) to the bottom position and preheat to 425 degrees F. Lightly oil a baking sheet or line with a silicone baking mat. Use a sharp knife to carefully stab the squash a few times on each side, then microwave 4 to 5 minutes. Watching out for steam, slice the squash in half and scoop out the seeds. Rub each half with oil and season well with salt and black pepper. 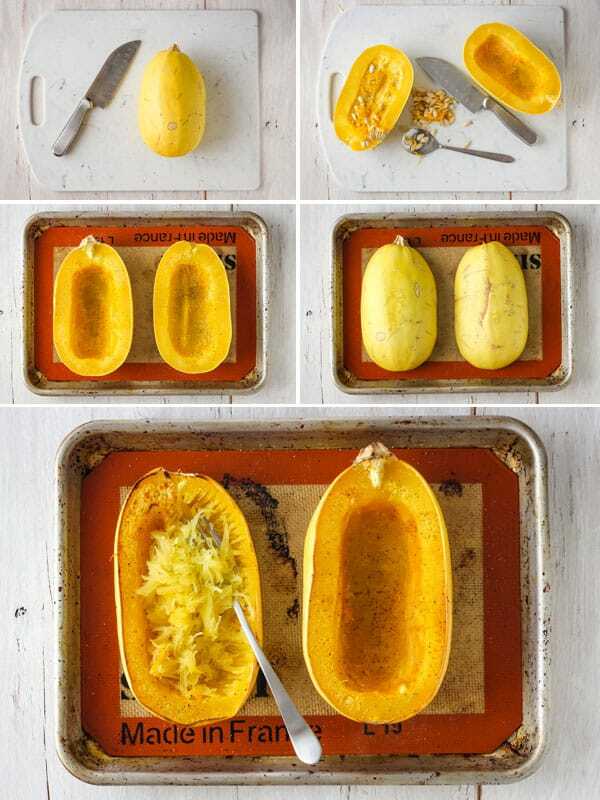 Place squash on the pan and cook until fork tender, about 30 to 45 minutes, depending on the size of your squash. Remove squash from the oven and cool for at least 5 minutes. Then, scrape a fork along the flesh to create spaghetti-like strands (leave a little behind to keep the ‘bowl’ intact for stuffing later). While the squash cooks, heat olive oil in a skillet over medium heat. Add the onion, zucchini, bell pepper, cumin, oregano, salt and pepper. Cook, stirring frequently until the vegetables have softened, about 8 to 10 minutes. Remove skillet from heat, add black beans and salsa. Stir well, taste, and adjust seasoning as desired. Add the loose spaghetti strands and half of the cheese to the skillet mixture, stir well. Load up the squash bowls with the filing and top with the remaining cheese. Bake uncovered in a 350 degree toaster oven for 10 minutes until warmed through and melty. Then Broil for 1 to 2 minutes until the cheese is bubbly and browned. Serve warm with your favorite burrito toppings. You can store the assembled boats in a covered container in the fridge for 2 to 3 days. To reheat, bake at 350 degrees F until warmed through and the cheese is melted, about 25 minutes. Nutritional information is an estimate of one bowl without any toppings. There are a lot of ways to cook a spaghetti squash. We like to use a hybrid microwave/toaster oven method. Pre-cooking the squash for 5 minutes in the microwave makes it super easy to slice open and scoop out the seeds. Then you rub both sides with a little oil, salt, and pepper. 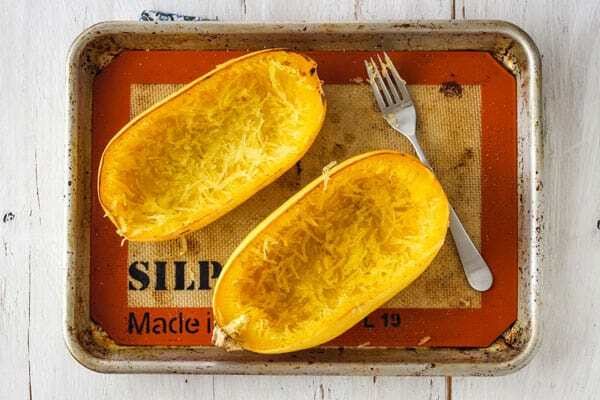 Pop it in a 425F toaster oven (or oven) and 30 to 45 minutes later you’ve got a tasty squash that’s ready to be stuffed. Microwave it until cooked through. Easy-peasy but kind of lacking in flavor. Pressure cook it. We just bought a little spaghetti squash to try in the instant pot mini! Got lots of time? You can even pop it in your slow cooker. This filing is soooo yummy. It’s great in the squash but I also like to make a big batch and eat it on top of a toaster oven frittata or scooped up with crispy baked tortilla chips. Did I mention it comes together super quick and has a bunch of good-for-you veggies? To make the filling, heat a little oil in a skillet. 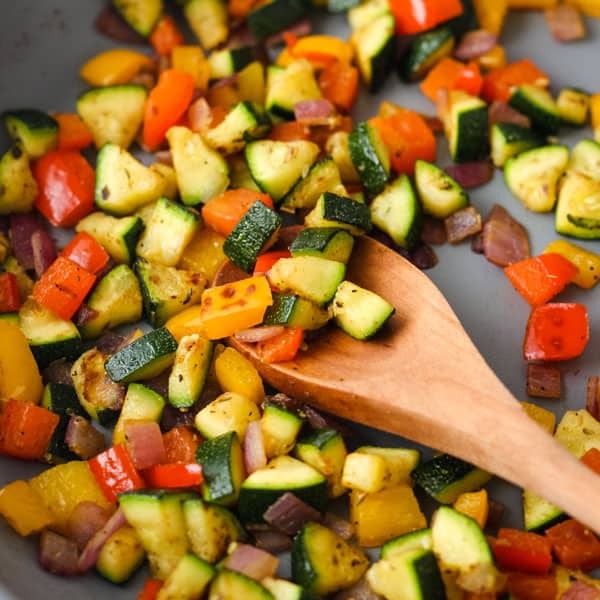 Add the chopped onion (or shallots), zucchini, bell pepper, smoky cumin, and herby oregano. In about 8 to 10 minutes the veggies will be tender and starting to brown. 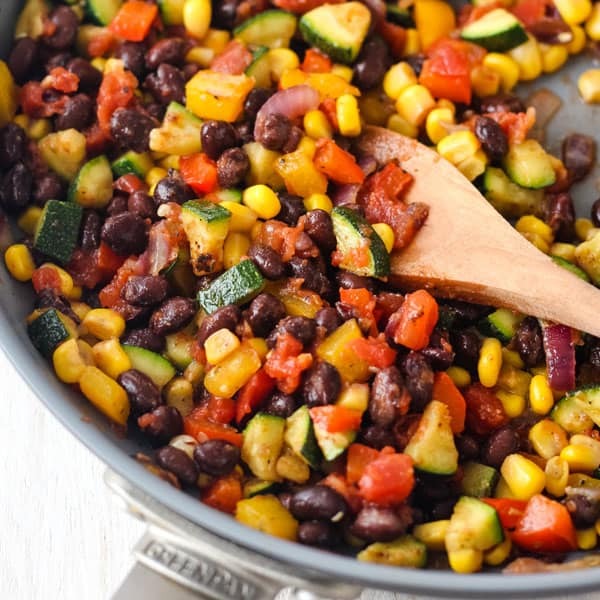 Now pour in some of your favorite salsa (we like the fire roasted kind from Sprouts), hearty black beans, and sweet corn. Sneak a taste to see if you’d like a little extra salt and pepper. Then hide your spoon or I promise you won’t stop coming back for more. Now that you’ve got you’re cooked squash and southwestern veggie filling, it’s time to combine them. First, grab a fork and drag it along the flesh to create spaghetti-like strands. I like to leave about 1/4 to 1/2-inch of squash along the edge. It helps the bowls stay intact. Scoop the squash into the skillet with your filling and add half the cheese (or more if you like things really cheesy). 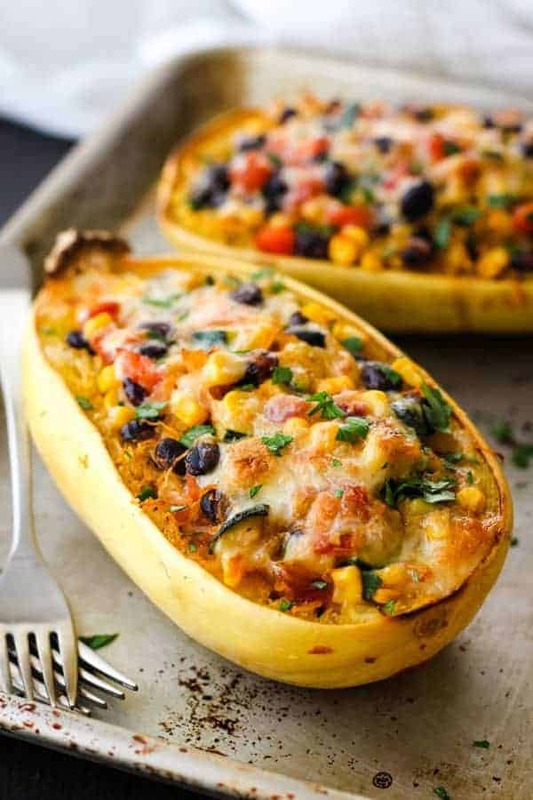 Now, overfill those spaghetti squash boats! I mean it, really pack that filling in there. Lastly, sprinkle on the remaining shredded cheese. Now it’s time to get everything warm and melty. 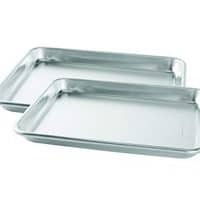 Toss the filled bowls on an unlined (aka no silpat) baking sheet and pop them in a 350F preheated oven-of-choice for about 10 minutes. If you’re like me and want your cheese browned and bubbly, switch the setting to ‘Broil’ on High for 1 to 2 minutes. All that’s left now is the toppings! If we’ve got guacamole or avocado on hand I add it but my favorite topping is a few dollops of Greek yogurt. Greek yogurt’s high in protein, super creamy, and has a tangy sour cream style flavor that completes the whole burrito bowl experience! I made this tonight. Absolutely delicious. Great recipe and I love how you explained how to roast a spaghetti squash! Well done!